Bad Diagnosis Leads to Bad Solutions. This is the most important question that any person can ask if they want to understand how an economy works and what is wrong with their economy today. We’ve all heard various explanations from partisan politicians and political pundits, but given the severity of the Political and Economic Toxic Cloud in the United States today, it’s clear they have not learned the right lessons from the Great Depression. That means there is a high probability that they have incorrectly diagnosed the causes of the Great Depression, which means their economic policies today are likely leading us into another economic calamity. Personal Savings Was Culturally Admired. Newspaper ads tend to reflect the cultural values of the societies in which they circulate. This ad was reflecting profoundly different cultural financial values than we see in the United States today. 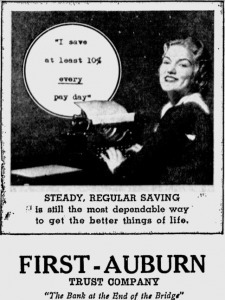 Rather than trying to transform us into zombie debt addicts, the message to the newspaper’s readership in 1934 was saying: “This girl’s not just a pretty face; she’s smart, too, because she knows steady, regular savings is still the most dependable way to get the better things in life. You too can have the better things in life if you’re disciplined and consistently save a portion of your income every month!” This ad illustrates an interesting fact: Prior to the 1980s, the bedrock of the United States economy was personal savings. Something Changed. Over the past eight decades since the Great Depression, what transformed a nation of disciplined savers into a nation of gluttonous consumers? Is it possible that humankind has evolved and transcended the primitive task of saving money before we can spend it? Have we invented new accounting math that magically transforms debts into assets before we accumulate the assets? These are serious questions that demand serious answers! The Great Stock Market Crash Did Not Cause the Great Depression. On October 24, 1929, the U.S. stock market crashed and then crashed several more times thereafter, losing nearly 90% of its value after the carnage was over. The stock market didn’t fully recover until 25 years later in 1954. Many partisan politicians and financial industry pundits say this was the cause of the Great Depression. This assertion is profoundly backward. It’s like saying the cause of an airplane crash is the smoldering debris on the ground after the crash. How did the airplane debris on the ground after the crash cause the crash? The Crash and Great Depression Had Much Deeper Causes. In fact, the stock market crash of 1929 was not a primary cause of anything. The millions of shares of stock exchanging hands in a stock market can only mirror what is already happening in the real economy. Moreover, only a tiny portion of the total U.S. population participated in the stock market. That means the stock market crash of 1929 can logically only be classified as a symptom of some other deeper causal economic phenomena at work within the U.S. economy in 1929. The Great Depression Could Have Been Prevented. The Great Depression, like all debt-based financial crises, could have been prevented. In fact, it had been lurking for years in the shadow of a post-World War I debt bonanza fueled by the prodigal monetary molestation of the Federal Reserve. The most authoritative primary source of raw data from the period leading up to the Great Depression comes from the U.S. National Bureau of Economic Research, which published a book entitled Mechanization in Industry, authored by Harry Jerome in 1934. It covers the period between 1920-1930 and is comprised of surveys of corporations in various industries such as brick-making, paper mills, iron and steel mills, industrial equipment manufacturers, telephone and telegraph providers, textile manufacturers, glass manufacturers, various commodities producers, among others.